For all the chocolate lovers, this one is for you! Chocolate covered Melomakarona. Incredibly moist, soaked in an aromatic honey syrup and dipped in melted chocolate.. Who can really resist? 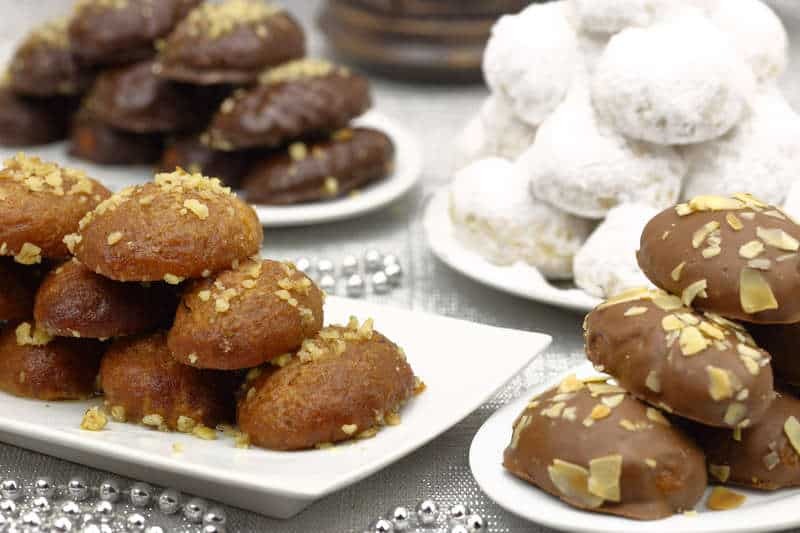 For the traditional melomakarona recipe (Greek Christmas honey cookies), we sprinkle the melomakarona with chopped walnuts and just a pinch of cinnamon and clove. This is delicious Greek Christmas classic recipe with a little twist, that uses chocolate to cover them (and optionally toasted almond slivers). To make the melomakarona we use the classic fool-proof recipe of the traditional Greek Christmas honey cookies and then we dip them in rich, shiny chocolate. You can use either dark or milk chocolate, according to your likings. For garnishing the chocolate covered melomakarona you can use either chopped walnuts, for a more traditional touch, or toasted almond silvers. Enjoy! Making this chocolate covered Melomakarona is not really difficult, but you have to pay attention to the details. First of all it is really important not to overwork the dough for the melomakarona, because this will cause the oil to separate from the mixture. Just knead lightly with your hands (like working with a meringue) until the flour has incorporated the mixture and the dough is really soft. Be careful not to add any more flour than this melomakarona recipe calls for, as this will make them tough. When syruping the melomakarona use the syrup cold and the melomakarona hot, in order to absorb the syrup. For covering the melomakarona, use some good-quality chocolate and melt over low heat. Combine the chocolate with butter or vegetable oil to get that shiny result. So go ahead, try out this traditional sweet delight and let the smell of freshly baked cookies, orange, cinnamon and chocolate remind you it’s Christmas! Enjoy! To prepare this chocolate covered melomakarona recipe start by making the syrup first. In a pot add all the ingredients for the syrup, except the honey and bring to the boil. Boil for 3-4 minutes, until the sugar has dissolved and remove from the stove. Stir in the honey and set aside to cool completely. Prepare the dough for the melomakarona. In a bowl add the semolina, flour and baking powder and blend with a whisk to combine. In another large bowl add the orange juice, the cognac, the sugar and spices (nutmeg, cinnamon, clove, vanilla). At the end add the baking soda and whisk immediately the ingredients for 5-10 seconds, until the ingredients combine and the baking soda dissolves and starts to foam. Pour in the bowl the water, the oil, the orange zest and honey and whisk to combine. Now it’s time to combine the two mixtures. Add the mixed flour, semolina and baking powder (from step 2) in the bowl with the rest of the ingredients from step 3 and start kneading the dough for the melomakarona. Knead the dough for the melomakarona using your hands, until the ingredients combine and the dough is smooth and soft. When preparing a melomakarona recipe, it is very important not to overwork the dough. Knead lightly with your hands (like working with a meringue) until the flour has incorporated the mixture and the dough is really soft. Be careful not to add any more flour than this melomakarona recipe calls for, as this will make them tough. Preheat the oven at 180C. Layer the bottom of 2 baking trays with parchment paper and start shaping the melomakarona. Pinch a portion of dough about the size of a walnut/ 50g (or bigger, if you prefer) and shape with your palms into a smooth oblong shape, like a small egg. Place on the baking tray, push lightly the top with a fork and make some holes on top (not all the way down). Continue with the rest of the dough. Place the baking trays with the melomakarona in the oven and bake for approx. 20 minutes, until the melomakarona are lightly browned and cooked through. When the melomakarona come out of the oven, place them in the cold syrup, flipping them with a slotted spoon to absorb the syrup for approx. 10-20 seconds, depending on how syrupy you like them. (When syrupying the melomakarona it’s best do so in 2-3 batches). Remove the cookies using a slotted spoon and place on a rack. Prepare the chocolate for covering the melomakarona. Break the chocolate into small pieces, drop into a heatproof bowl and add the oil or butter. Set the bowl over a small saucepan about a quarter full with hot water and place the bowl on top so that it rests on the rim of the pan (the bowl should not to touch the water). Place the pan, with the bowl on top, over low heat until the chocolate has melted, whilst stirring occasionally. Dip each one of the melomakarona in the chocolate and place over a rack. If you like ti garnish with chopped walnuts or toasted almond silvers, do that know. Leave them for a while to cool down and serve on a platter. Store the chocolate covered melomakarona at room temperature in an airtight container. They will last for all your Christmas Holidays!